While most pond owners are content to use their ponds purely for aesthetic purposes, there are others that want to get more functional use out of them. 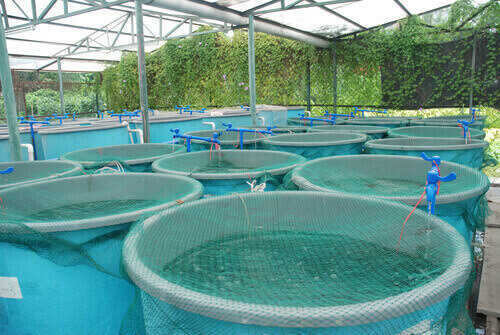 One method of doing this is through aquaculture, or fish farming. This method has been practiced since ancient times and is a great way to maintain your own supply of great tasting food. Selecting the correct production site is extremely important, as it will determine the species of fish that you’re able to produce and the construction cost. An ideal site is one that has lots of water that is high in quality, with outstanding topography that allows you to build an affordable production facility. The soil should also be optimal for the development of the pond. The soil will need to be tested in order to ascertain its quality, and it is critical to ensure the chosen site is well away from locations that are prone to flooding. You will also need to develop an efficient method for disposal, ensure the site is not polluted, and develop a plan for potential future expansion. Next you will need to decide how large you want your aquaculture pond to be. The size of your pond will ultimately be determined by how much water are present, the technology that you intend to use, and the production level you wish to target. A system which is intensive needs less land while systems which are semi intensive will need more. You will also need to consider the capital you have available to invest. Other factors which will limit the size of the pond are the topography, harvest frequency, land availability, and the species of fish that you intend to farm. As such, giving recommendations for optimal pond sizes is challenging since each pond project will be different. However, regarding shape, it has been found that rectangular shaped ponds are much simpler to manage. Furthermore, a fingerling type pond should always be smaller than a fattening pond. Once you’ve chosen the size and site of the pond, you will next need to design it. You must determine the total water area surface, its width and length, and how deep the water will be. Other factors that should be taken into consideration include the slope of the pond bottom and dykes. Once you’ve obtained this information you can make the other calculations. Building an aquaculture pond is far more complex than a standard backyard pond, which is why you should hire an expert. They will help you choose the best site, size and species of fish, and then they will begin the project by moving the top soil and storing it nearby until needed. The area will need to be cleared and a TBM or Temporary Bench Mark will need to be setup, as it will mark the ground which designates the elevation and which will be used as a point of reference for other elevation.